Meeting Packages allow you to create a monthly allocation of free hours against different meeting rooms for a member. Once the allocation is used within a month, the member will then be charged for any additional hours. Meeting Packages cannot be used for a member who already has discounts against meeting room rates. Ensuring that meeting room types are configured. The packages cannot be set up without them. Defining Regions. These are used in situations when you want to provide your customers with access to specific locations within your organization. Creating the actual meeting package. Go to Settings > General > Customize > Products > Standard Fields. On the Products - Standard Fields screen, search for the Meeting Room Type field and click on it. To add meeting room types, go to the bottom of the screen and click New. Enter the Meeting Room Type Name and click Save. Your field will now be displayed in the list of meeting room types. Go to Space > Products, then create or edit the meeting room you want to include in a meeting package. Learn more about configuring Meeting Rooms. 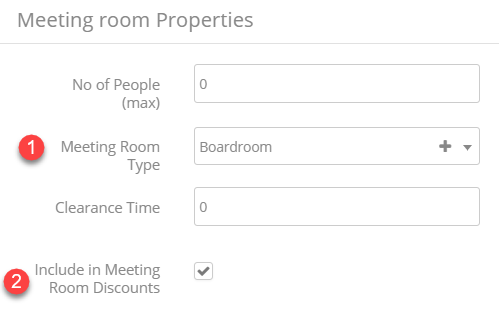 Under the Meeting Room Properties section, select a Meeting Room Type for the room you want to add to a package. Next, Include this room in Meeting Room Discounts - please check the checkbox in order to allow the system to list the meeting room as available for packages. The Region field is a standard field within Operate and can be customized by going to Settings > Customize > Locations > Standard Fields. Find the Regions field and click on it, then Edit. You can change the label, add picklist values and add help text for this field, Save your changes to ensure the completion of the setup. Your Regions will now need to be associated to your Locations. To do this, go to Settings > Customize > Locations > Page Layouts and make sure that the Region field is added to the layout. 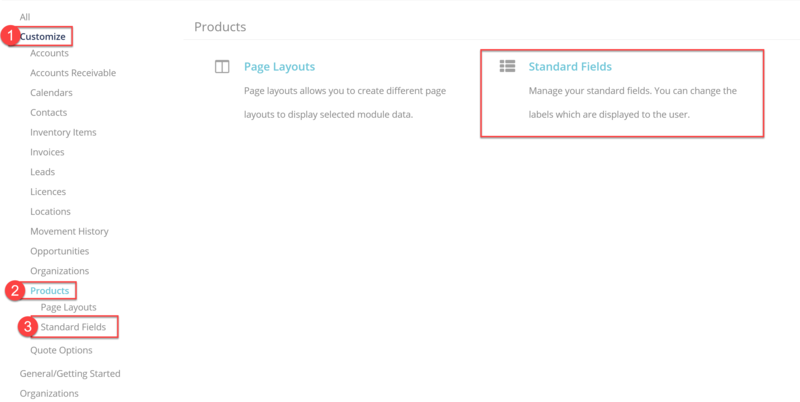 Read more about customizing page layouts. Now, go to Space > Locations and select one from the list by clicking on its name. Select the region to which the location belongs, then click OK.
Go through steps 5 and 6 for all locations that you would like to use. When setting up a meeting package, Operate will provide the client with access to all of the location found within a specific region. You can create meeting package's for either your members home site or your members region - however you can only have one package for each. E.g you can have a package that applies to home, and a package that applies to other sites in their region, but you cannot have two packages at their home site. If you need more than one package for their location, we would recommend using credits or standard discounts (although standard discounts would be applied at the point the booking is invoiced not generated). To create meeting packages, go to Settings > Customize > Calendars > Meeting Packages. Enter your package general information - Name your package and enter the Maximum Allowance Hours (per calendar month). Please note that the number of hours may not contain decimals; therefore only full hours may be allocated. 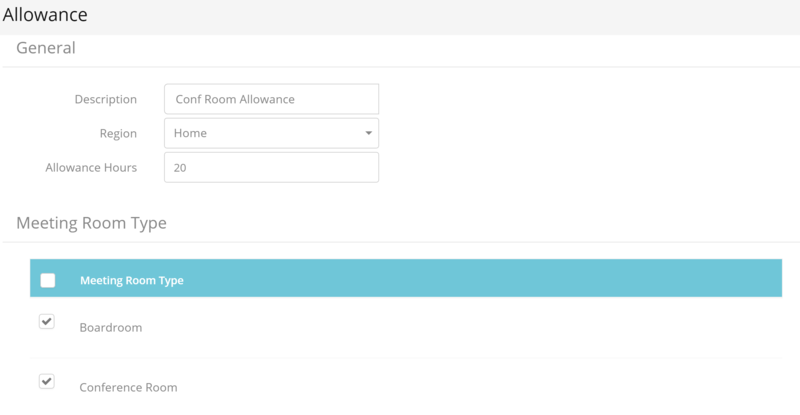 Assign the Allowance to a room type by clicking Add Allowance.and enter your Allowance information: Adding an allowance is mandatory for the plan to apply correctly. Select the Region where you want the allowance to apply - You can either apply it at your customer’s home location - where their account is active - or in a different region, which may include one or more locations/buildings. Here is where you will only be able to pick the regions that you have set up under Settings > Customize > Locations > Standard Fields > Regions. Please note that only the locations that you have assigned to these regions will be available for packages. Ensure that your desired location is included by going to Space > Locations > Select Location; and checking that the region is set. Set the Meeting Room Type for which you want to apply the allowance. Select one or more types from the list and the allowance hours that you have set will be applied according to your selection. Customers will be able to use the allowance for any of the room types you select here. Please note that only meeting rooms that have a type assigned will be made available within the package. To ensure that a specific room is available, please use the search box next to the Operate logo to look for the desired meeting room and ensure that the meeting room type is assigned. The setup above allows members to book 20 free hours for either a Boardroom or Conference Room at their Home location only. Once these hours are used within a calendar month, the member will be charged, even if the booked room fits the allowance; due to the hours exceeding the allowance. Save your allowance to complete the setup. The meeting package will now be available to use with your customer licences. 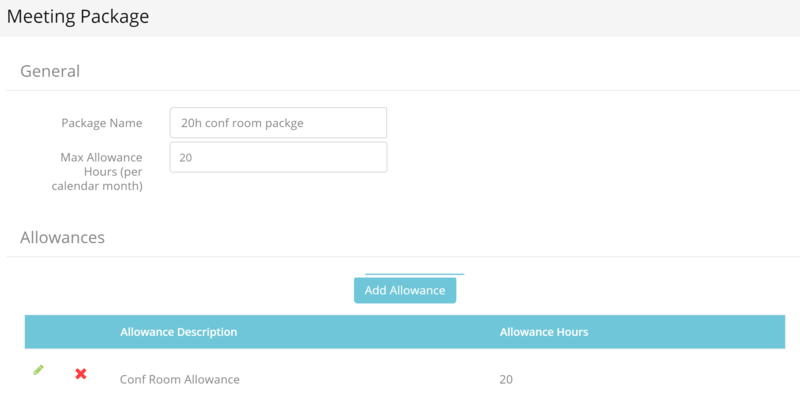 When the customer will book a room that fits the types set in the package, they will not be charged for the amount of hours included in the allowance. You can also use Meeting Packages as a list view filter or workflow criterion.